So, where have I been? I promise I did not forget about you, blog. I really didn't. I was out of town a lot and had guests not to mention I spent a long time there in September and October using up yarn for the Single Skein Situation challenge. Speaking of the challenge, it is long over and I managed to get through a LOT of yarn. Not all, but a lot. I'm proud of that fact and I've already sent some of the hats I made to another person on Youtube who was gathering some for her local charity. The rest and some other things I made are going to be dropped off at my local charity this weekend. I did make a few things that will be kept either for my husband and me or to give for gifts this year. I made 2 finished objects videos during that time which you can see here and here. I did a review type video of the Isaac Mizrahi yarn line. You can check that out here if you're interested in hearing and seeing my thoughts on the yarn. 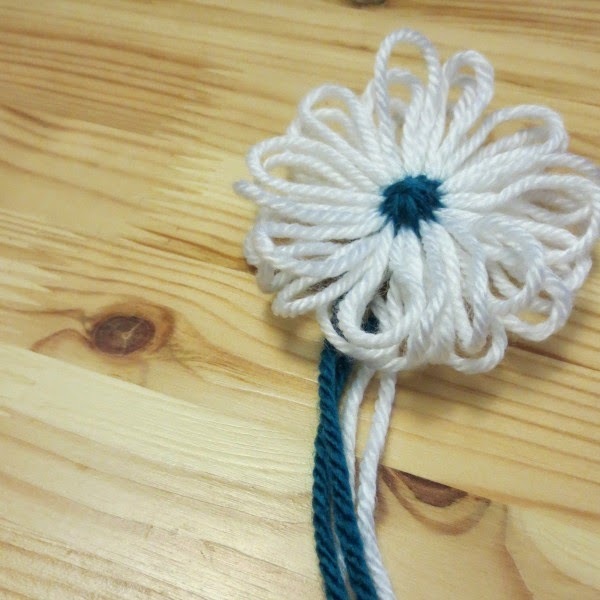 And today, I uploaded another tutorial video showing how to make a flower on a flower loom. They are really cute, see? Here's a link to that video. Hm...what else? I did manage to enter most of the KALs I wanted to, but not all. There just wasn't enough time quite frankly. I'm okay with it though. I mean, out of the 18 skeins I had wanted to use. I got through 12. That's a lot for 6 weeks (at least for me, it is). I have to admit, there weren't a lot of entries in for the prize. In fact, there were only 2 other than myself so I just gifted them both a pattern. I figured that was my way of saying, "Hey you, awesome job. It was just the 3 of us in it together so let's all have a new pattern." I still haven't bought a new pattern for me, but I think I might just buy myself a book. I have bought some things. I bought a couple new spindles and a couple of project bags. I've only received 1 spindle so far. I've already managed to get through a couple of ounces of fiber on it though so that's exciting!